HRMatrix is a human resources management system (HRMS) designed to suit businesses of all sizes, which offers users a range of tools for employee management, time and expense tracking, time off management, collaboration (Live Chat), document management, project tracking, training management, attendance tracking, and many more. It starts from Job Postings, you can post any number of jobs on your career website using HRMatrix Job Posting portal. Candidates can apply against these job posting. Interviews can be scheduled at one place. Built-in email templates are created in the system to start communicating with candidates. Recruiters can search candidates in a centralized database, with candidate data and resumes stored, and can create onboarding tasks for new hires which are then assigned to individual staff members for completion. Interviews can be scheduled in at a centralized place in HRMatrix. HRMatrix also handles termination and offboarding processes, including collection of company assets, and generates full audit trails for compliance. Built-in Employee on-boarding process takes care of employee on-boarding from start to finish , once employee is converted to hired state, employee data is entered in HRMatrix automatically. Emails will be sent to responsible personnal to complete on boarding tasks. When employee data is entered into HRMatrix, fields in connected modules are automatically populated, reducing the need to re-enter information. Employee documents, including signed forms from the hiring process, can be stored, with support for multiple file formats. HRMatrix includes an employee, self service portal, allowing employees to submit their own time off requests, for vacation, paid time off, sick leave, family leave, medical leave, or any other regulated leave type, as well as submitting timesheets and expense claims. Managers can then approve these requests through multi-level approval process. HRMatrix automatically calculates hours worked and time off accruals, and updates systems including payroll and benefits with the changes. Workflows are built-in the system and can be customized to meet timeoff approval requirement. Employee Time Tracking capability tracks employee time and project financials to measure the cost benefit analysis of the project. It tracks the billing cost, project actual cost and project forecasted cost in a single platform. Employee chat provides an embedded platform for employee to chat on real time bais. 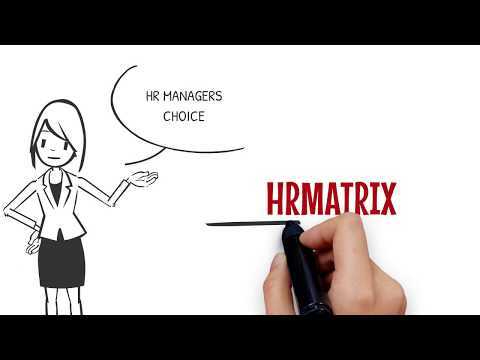 If you are using HRMatrix there is no need of any other collaboration tool. In a nutshell, HRMatrix tracks a complete life cycle of employee at the organization from hiring to onboarding, employee profile data, intra-organization collaboration, employee leave management, employee expense tracking against projects and tasks, timesheet management, automatic filling of timesheets with clock-in and clock-out, centralized place for employee and company document management, employee performance management, employee training tracking, employee benefits tracking, full insight of employee data visibility with reporting, and many more. It's a complete solution to manage your employees in better, faster, cheaper and simpler way. Please test drive, it's free!! Customizable to our business Great customer support Easy to use employee interfaces Outstanding for organizational communication I test drove no fewer than 10 HRMS on my way to settling on Orblogic. Gary and his team provide terrific training, are completely accessible, and are eager to help. Part of my interest in this program is it is new to the market, and therefor our organization can grow with the program, which was exciting to me. This will soon be the industry standard HRMS. Some of the move involved features can be a bit complicated. As a growing professional services organization we needed a Human Resources solution that can meet our needs at this time and future. HRMatrix met our needs to manage our employees, projects , planning, accounting and human resource requirements. Most of the modules already comes with with all necessary tools that we needed to manage our day to day resource management for consultants in different locations. In addition, when we needed a custom module specifically needed for our business model, HRMatrix support team was very helpful to come up with the right solution. Since the product is hosted in the cloud, we did not have adhere the extra cost of hosting by our selves. The initial training we received from HRMatrix support was very helpful for our Human Resource and accounting teams to start using the product and structure the organization and projects properly. HRMatrix workflow interface was easy to use for our non technical staff but does require some setup and training to properly setup the product. While experiencing some issues, HRMatrix support was very responsive with quick resolution. Not always intuitive. User guide is not comprehensive enough to cover some issues. However, I will say that I'm customizing for firehouse usage--not your standard HR environment. It's very flexible but some of our customizations mean the user guide isn't always helpful. Customer support has been fantastic though. Relatively easy to learn the functionalities and nice options to register and manage most of your human resources needs in any size company. The customer support is none existence! and the funny thing I used this software while working for MATRIX!!! Orblogic's HRMatrix subscription fee is based on per employee per month. The performance reviews allows users to define business goals and objectives, and conduct employee reviews against these, with the ability to schedule and select second reviews, peer reviews, and 360 reviews as an automated task. Real time collaboration (Employee Chat) let the employee collaborate effectively. It's a complete win-win-win with effective employee collaboration. Users can link employees with provisioned resources or assets, such as credit cards, vehicles, computers, and mobile phones, select and assign employees based on their knowledge of or training on specific assets, and track and update assets for personal or company use. HRMatrix gathers termination data prior to and during the separation process, aids in the collection of company assets, provides required notifications, presents time-critical info for exit interviews, and generates full audit trails for compliance. The time and attendance module allows employees to schedule vacations and submit absences requests, and tracks employee absences, with reasons including vacation, illness, and personal issues, and users can also define their own reasons for absences. Below are some frequently asked questions for HRMatrix. Q. What type of pricing plans does HRMatrix offer? Q. Who are the typical users of HRMatrix? Q. What languages does HRMatrix support? Q. Does HRMatrix support mobile devices? Q. Does HRMatrix offer an API? Yes, HRMatrix has an API available for use. Q. What other apps does HRMatrix integrate with? Q. What level of support does HRMatrix offer? Q. Which apps is HRMatrix compared to most often?